Download DA Form 918A, also known as, Agreement For Establishment And Maintenance Of An Army Senior Reserve Officers’ Training Corps Unit. This form is a legal and binding document, used within the U.S. Army as a positive response for a request to establish a Senior Reserve Officers’ Training Corps Unit. Once signed and agreed to by all required parties, this along with other legal and binding documents will allow for the implementation of all plans as described in completed DA Form 918. Enter the number word (ie: Fifth) of the Brigade, U.S. Army Cadet Command, into the line at the top of the page in the “subject” area. 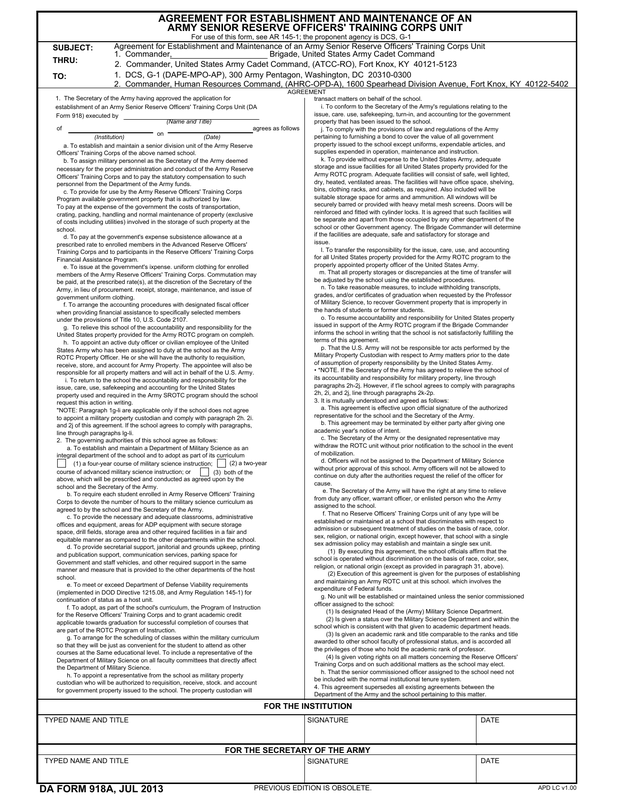 Step 2 – Just inside the “Agreement” block, in the left column, 1. is for The Secretary of Army use only. Step 2 – All parties involved should carefully read the numbered paragraphs of the agreement as well as it’s lettered subsections to ensure accuracy of the agreement. Step 3- Once it is understood that all parties are in agreement signature will be required. Once the document has been read and signed, the agreement is in order. This form is fillable online and printable for manual use and/or sending.